Bhimsen Temple is the one of the temples inside the Patan Durbar Square and is situated at the Northern end of the square. This temple is mainly dedicated to Bhimsen, one of the five Pandavas of Mahabharata who is also regarded as the god of trade and business and is mainly known for his strength and bravery. There are also many temples devoted to Bhimsen in Nepal as he is considered to be the ultimate deity of economy by the Nepalis. This temple has three inter-connected golden windows which overlooks the Patan Durbar Square. 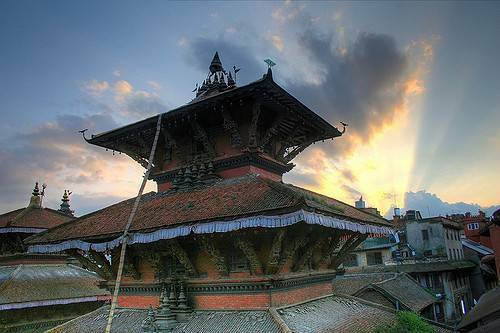 This three-storey temple is considered to be distinctive apart from other temples of Patan. It was built by King Shree Nivas Malla in the 18th century.